TEG3210P is the best choice for wireless and surveillance projects. Besides the useful management features, it also provides 8 10/100/1000 Base-T Ethernet ports and 2 separate 1000 Mbps Base-X Gigabit SFP slots. Ports 1~8 applies IEEE 802.3af PoE (15.4W) or 802.3at PoE+ (30W) compliance, up to 40W power output per PoE port, which can supply power to high-power PDs such as dual band/11AC devices. The switch can transmit data at the same time to AP, IP Camera or IP Phone via Cat.5 twisted-pair cables. In addition, it provides stronger safety protection system, improved QoS policy, multiple VLAN features and higher availability of maintenance. To sum up, Tenda 8G+2SFP Managed PoE Switch is an ideal and safe switch to set up your network. power and maintain your switch? TEG3210P, it is the best choice for wireless and surveillance projects. Besides the useful management features, it also provides 8 10/100/1000 Base-T Ethernet ports and 2 separate 1000 Mbps Base-X Gigabit SFP slots. Ports 1~8 applies IEEE 802.3af PoE (15.4W) or 802.3at PoE+ (30W) compliance, up to 40W power output per PoE port, which can supply power to high-power PDs such as dual band/11AC devices. The switch can transmit data at the same time to AP, IP Camera or IP Phone via Cat.5 twisted-pair cables. In addition, it provides stronger safety protection system, improved QoS policy, multiple VLAN features and higher availability of maintenance. To sum up, Tenda 8G+2SFP Managed PoE Switch is an ideal and safe switch to set up your network. 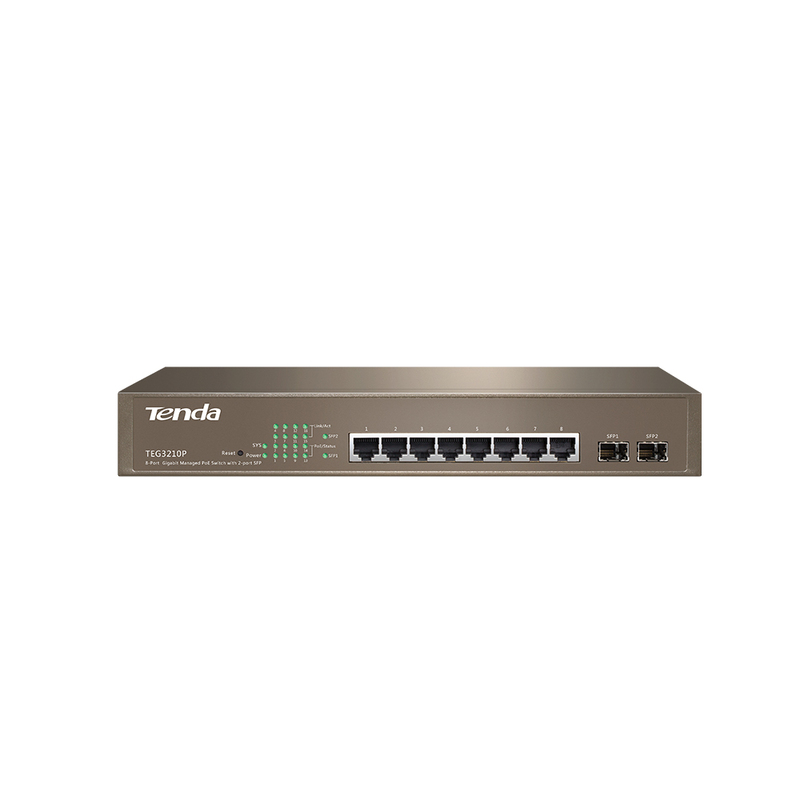 Tenda 8G+2SFP Managed PoE Switch has 8 Gigabit Ethernet ports and 2 SFP independent optical ports; Ports 1~8 support PoE (AT/AF) and up to 40W power output per PoE port. Tenda 8G+2SFP Managed PoE Switch supports VLAN, IP+MAC Binding, QoS, DHCP Snooping, Telnet etc. By Cat.5e twisted-pair cables, Tenda TEG3210P can transmit the power and data up to 150m .